West Ham won today 4-3 to Huddersfield Town in a Premier League match in the London Stadium. Late goals by Javier Hernandez, and Angelo Ogbonna allowed them to avoid an embarrassing loss to a soon-to-be relegated club that came to life with goals from Juninho Bacuna, and a brace from Karlen Grant. Early on the hosts struck first. While driving with the ball into the area, Manuel Lanzini was taken to ground on a poor challenge by Aaron Rowe. The resulting penalty was taken by Mark Noble who sent it down the middle to give the Hammers an early lead. But two minutes later on an Aaron Mooy corner kick, Hudderfield’s Juninho Bacuna lost his defender and rose for a strong header which found the near side of the goal. Poor marking on set pieces surrendered the early lead for West Ham and would haunt them again in the opening half. At the 30 minute mark, Alex Pritchard found an unmarked Chris Lowe to the left of the penalty area. He crossed to Karlen Grant, whose light strike rolled just inside the far side post to give Huddersfield the unexpected first half lead. At the break, Pellegrini added Javier Hernandez to add attacking options. Later Samir Nasri was brought on for some more midfield creativity, but those changes did free up space in the midfield. Huddersfield took advantage of that space on a one-man counter attack where Karlen Grant split between Ogbonna and Diop and fired a laser strike from 20 yards out to take the 1-3 lead. With disjointed play from the central defenders, Ogbonna did have a chance to redeem himself. In the 75th minute on an Aaron Cresswell cornerkick, Ogbonna rose above the crowd at the six yard line to head in the ball and give the hosts some needed life. Ten minutes later a well-played Nasri cross found Chicarito, whose diving header from six yards out brought West Ham level. At this point, the hosts had all of the momentum, although a late effort from Huddersfield saw Terence Kongolo one-on-one five yards out, but Lucas Fabianski batted the shot into the path of Jason Puncheon, who miraculously sailed his 8 yard strike well over the crossbar. 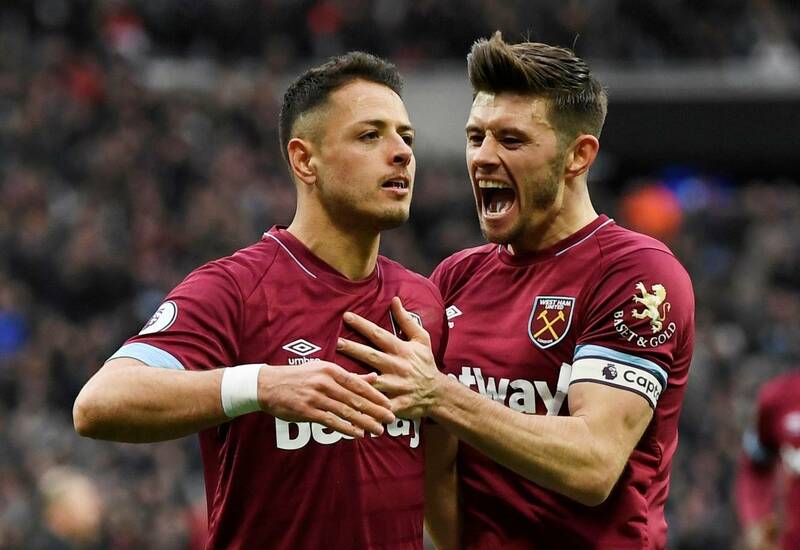 Disaster averted, and Filipe Anderson closed out the final minute of regulation with a cross to Hernandez, who headed into goal and gave West Ham the victory. No fan of West Ham United can say that there are not glaring deficiencies on the defending side of the pitch. Whether Pelligrini can address them over the final weeks of the season, or they will be resolved through the transfer market remains to be seen. But surrendering five goals to two of the worst clubs in the league in back to back weekends shows West Ham isn’t ready to compete for European football. Despite the poor defending, the club did give the home supporters some excitement and those who stayed the entire match saw a great comeback. The club gets a week off before hosting Everton . Go to TheWestHamWay.co.uk for the latest on injury and transfer news leading up to the final weeks of the season.